Like so many early Americans Daniel Hertzler was an entrepreneur. Born in Lancaster County Pennsylvania in 1800 he grew up as a Mennonite. 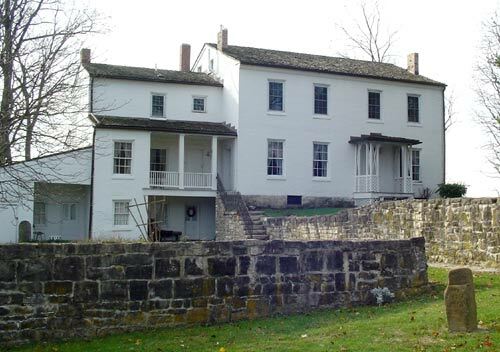 During the early 1830s Daniel, his wife Catherine, and their first child Barbara moved to Clark County Ohio. He managed a farm, a sawmill, a gristmill and a distillery. Later in is life he would start the Old Clark County Bank. In 1850 Hertzler purchased 315 acres of land southwest of the Springfield. After tearing down Jonathan Donnels 1795 log cabin, the Hertzlers built their home overlooking the site of the old Shawnee village of Piqua. The Hertzlers would have 10 children and lived a good and prosperous life until the fall of 1867. Even with owning a bank there were rumors Daniel Hertzler kept large sums of money in his home. Just rumors perhaps, but that was all that was needed. On October 10,1867 Daniel Hertzler was found shot to death in the northwest room of his home. Authorities arrested 2 men suspected of the crime, but they later escaped and the mystery was never solved. The farm stayed in the family until 1914 and is today owned by the Clark County Park District. Restoration began in the 1960's and continues today. The kitchen fireplace has been rebuilt with its secret metal box placed within. Today the museum is furnished to its1855 appearance of a pre-civil war American home. 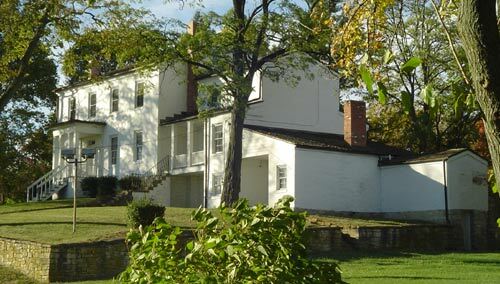 The Hertzler farm contained the land which is today the George Rogers Clark Park. It is the site of the largest Revolutionary War battle west of the Allegheny Mountains. The park offers hiking biking, fishing as well as an educational experience into 18th century frontier life. Historic interpreters celebrate events like the Paw Paw Moon Pow Wow and the Fair at New Boston. Geroge Rogers Clark was the older brother of William Clark that led the famed Lewis & Clark expedition to the West Coast of America in 1804 - 1806. Daniel Hertzler built his barn in 1854 in the style of his Pennsylvanian roots. In 1951 the structural integrity of the barn was such that it had to be torn down. For the next 56 years just the 40 x 60 foundation of the old barn could be seen. In 2007, the barn began to see new life. On the Chamberlin farm in Montgomery County Ohio a barn similar to the Hertzler barn was set to be demolished until preservationists stepped in. They dismantled the structure and carefully moved it to Clark County. Today the Chamberlin barn has been refitted and rebuilt on the foundation of the original Hertzler Barn. A perfect marriage completing the Hertzler homestead museum.